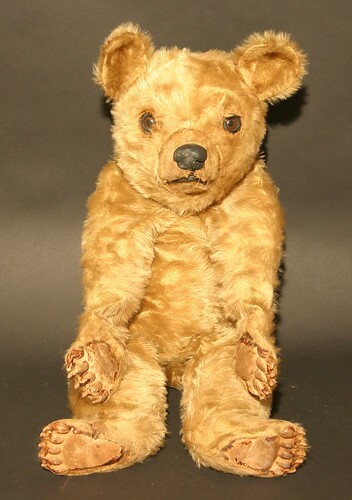 £900 paid for a rare 1950’s Deans Rag Book Co, “Tru-to-Life” bear designed by Sylvia Wilgoss, with golden mohair plush, brown eyes, black nose and moulded rubber padded paws, 65 cm high. (high resolution image here). £500 paid for a Walkure bisque doll with feathered eyebrows, sleeping brown eyes, open mouth, four upper teeth and pierced ears, impressed “Walkure, Germany 6”, on a composition ball and jointed limb body, wearing a straw hat, cream lace trimmed cloak and various undergarments, 69 cm high. £500 for a Pelham Puppet Theatre with 32 various puppets including Ogre/Giant, Dragon, Hansel & Gretel, Ermintrude, Rupert Bear, The Horse, Mickey & Minnie Mouse, Pinocchio, Goofy, Caterpillar, Witch with guitar, Gypsy Fiddler, Animal plus drum, Donald Duck, Pluto, Snake Charmer, Skeleton, The Frog, and more. (high resolution image here). £500 for a Victorian and later pram with green button back leather lining to a later carved carriage, on a green painted wrought iron metal frame, with cream pottery handles, on four spoked wheels. The biggest surprise of the day, so far, is quantity of bisque and other cake decorations and other decorations including Father Christmas, gnomes, Puss in Boots, Bonzo, robin, etc. (approx. 50), together with a bisque figure of a mouse entitled Teddy Tail by Hewitt Bros. Willow. Estimated at £50 to £80, the lot was sold for £480. The auction has attracted bidders from around the world, as well as across the UK, with particular interest from collectors in America and Japan. The toys are all being sold on behalf of the owners of the famous Park House Toy and Collectors Museum in Stow-on-the-Wold which closed in June. A full press release will be issued tomorrow (Friday). The auction is likely to conclude at around 5pm today.